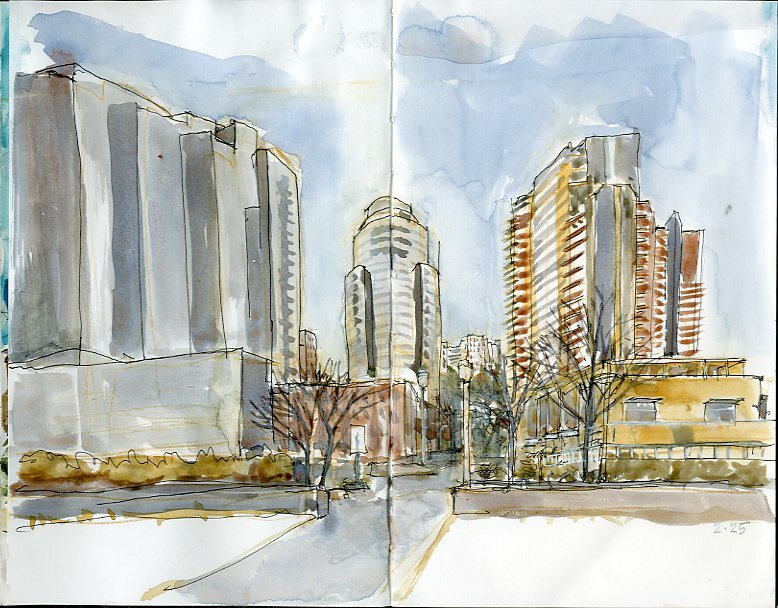 Ellie was out of town for our last sketchcrawl so we went back to the South Waterfront when she returned. Here are our sketches, first hers, then mine. 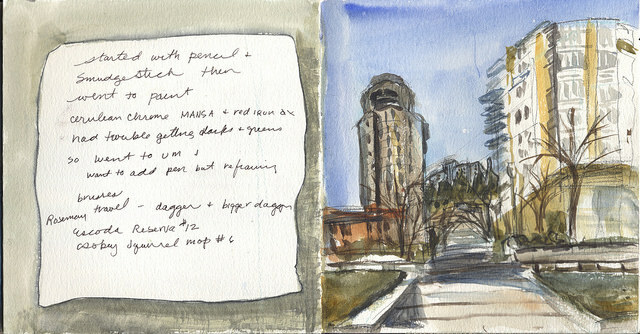 Here's my little sketch from our outing last week. By the way, I think the cherry trees on the waterfront are already about to bloom. 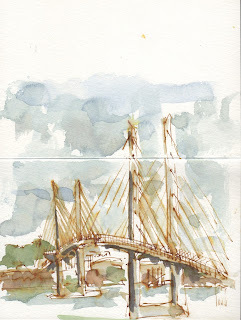 This past Saturday morning, I loaded up my bike basket with art supplies and rode over the Tilikum Crossing down to the South Waterfront where we met for this month's sketchcrawl. A short ride from our meeting place was a sunny viewpoint showing the full expanse of the Ross Island Bridge. The steel structure is going to be repainted this year and in real life, it is faded. I took some liberties with color and decided to show how nice it will look in bright green. 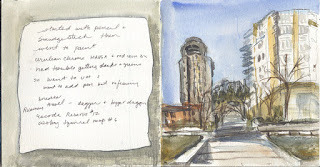 As I finished up the ink for this painting, the sun was warm and I was even able to take off my coat. A sail boat floated by with 4 pirates on deck singing,"What will we do with a drunken sailor, early in the morning?” By then, it was a bit late to be considered early in the morning, but at the sounds of it, they had the drunken sailor part just right. I was sure it was going to be raining but the day was beautiful. I haven't been in the South Waterfront area much. What a great place to draw! There is something of interest in every direction. I decided to turn my back on the water for this one. I have been watching this bridge being built for the last couple of years but this is the first time I have been close enough to sketch it. I thought I'd try something a little different. 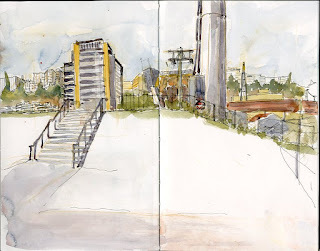 The first sketch was with my regular approach; ink and watercolor and the other two are watercolor only (the last one in a larger format sketchbook). This was a challenging subject no matter what approach....but fun too. 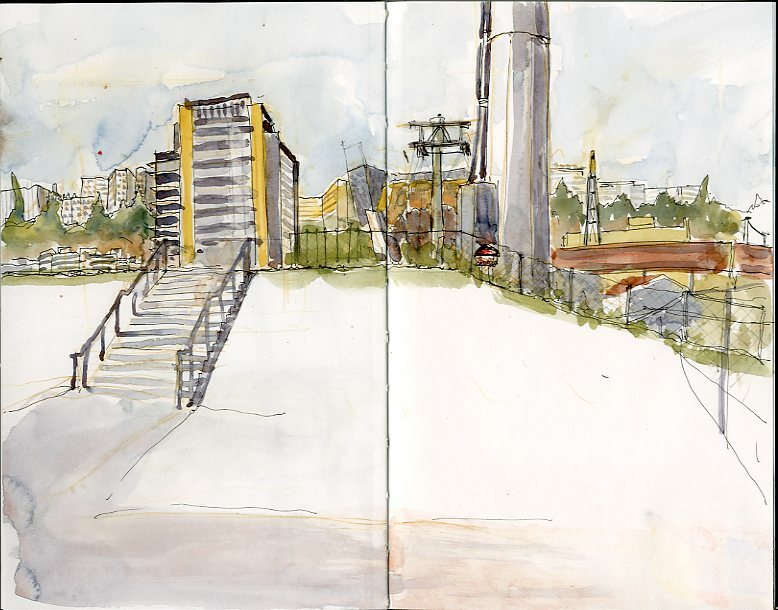 All three sketches were all from the same view point. 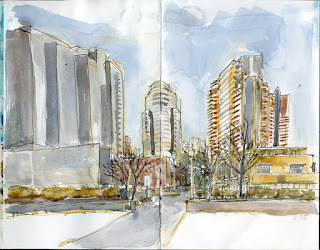 I'd noticed that the demolition was continuing on my way to the Broadway Bridge one day last week. But I didn't get a non-rainy day to go back until today. 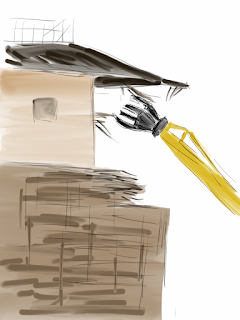 And found that there are actually two cranes simultaneously tearing the building apart, one at the front and the other at the back. Ellie came over to try out a new mop brush I had bought. 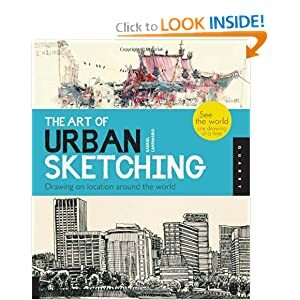 We fooled around with it inside a bit before venturing out to draw on the street. 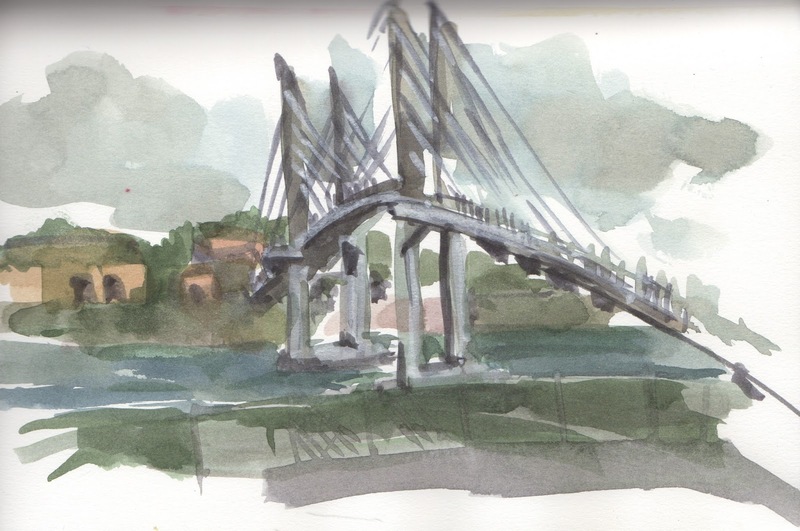 Let's go sketch Tillicum Crossing! It may be raining but we can always sketch from inside a coffee shop. I found out my previous idea for a coffee shop was maybe too small. So let's try Rilassi. It may be a bit further but I think it'll be easier. If you do know a better place to meet, let me know in the comments. 10:00am - Meet at Rilassi, 3580 Southwest River Parkway, for introductions, coffee, and snacks. 10:30am - Sketch around Tilikum Crossing. 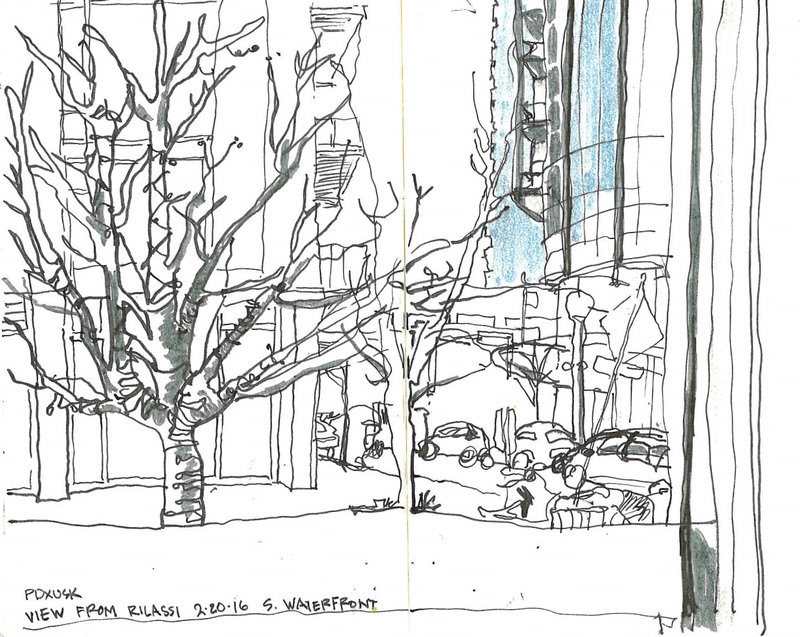 12:00noon - OPTIONAL sketchbook sharing and lunch at Cha Cha Cha, 3135 SW Moody Ave. They seem to always be blooming early. So let's plan for this.